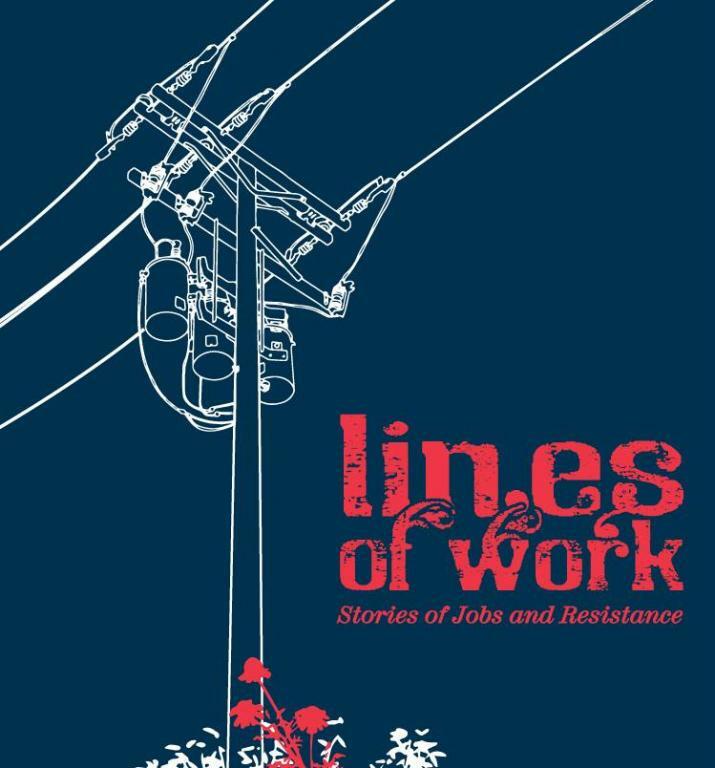 A review of Lines of Work: Stories of Jobs and Resistance by Peter Moore. Nappalos, Scott Nikolas, ed. Lines of Work: Stories of Jobs and Resistance. Edmonton: Black Cat Press, 2013. Paperback, 236 pages, $19.95. “Lines of Work” aims to have workers tell their own stories, and it succeeds remarkably well. The book packs 32 stories by 24 workers into its pages. At least 10 contributors are former or active IWW members. The material first saw light on the Recomposition Blog, a project of worker radicals. For anyone who has attended an IWW Organizer Training, the most memorable parts are usually the stories the trainers and other workers tell during the training or over beers at night. Many of these stories are like that. Some are just fragments of experience jotted down. Others are in-depth examinations of personal experiences on the job. It is oral history of a new generation of workers coming to grips with today’s capitalism and its many managers, including those culturally grafted into our heads. The book is divided into three sections: “Resistance,” “Time,” and “Sleep and Dreams.” “Resistance” features essays by postal, warehouse, food service, non-profit, and financial services workers. Phinneas Gage recounts what a postie’s (postal worker’s) fellow workers did to protect him from a retaliation firing. Monica Kostas describes how she made contacts across her workplace by agitating for—surprisingly—the reinstatement of birthday cakes on the job. Juan Conatz, who has a great writing style, tells how he and his co-worker resisted speed-ups on the job until exhaustion got the better of him. The “Time” section describes the many personal challenges facing workers, including the commonplace lack of boss support for worker safety. The essays by the Invisible Man on life as a bullet maker or a temporary agricultural worker are highlights simply for their beautiful writing. The “Sleep and Dream” section chronicles the pervasive influence of work on the writers’ lives. The stories range from funny to tragic, from sleep-running naked thanks to work nightmares to the sleep deprivation of “clopening” (closing the shop at night then opening the next morning) at Starbucks. Reading this book there is a sense of continuity and shared experience even as each story intimately reveals the individual’s own experience. The fatigue, the abuse, the work dreams, the restlessness, the desire to change the job before it consumes one—is this not our life, too? These perspectives are what make this book worth reading. A few of the essays would be good discussion pieces for organizing round tables or training sessions, simply because they strip bare the stereotypes and comfort of organizing theory and reveal the ugly complexities and moral dilemmas of organizing. Fear, loss, pain, betrayal are all there as well as the courage, determination, endurance, and sense of humor of our class. Jomo’s piece on life as a nursing assistant is one such piece. Grace Parker’s article on her experiences with sexual harassment is another. I see now why the Edmonton IWW General Membership Branch gave a copy of this book to each delegate at the 2013 IWW General Convention. It is worth reading, thinking and talking about. If these authors can be as honest as they are with us about their experiences, now it is our turn to reflect on, share and learn from our own experiences—and to organize from there.